New publications describe the impact of recent illegal logging in Bialowieza Forest, Poland. Direct and indirect impact on the Natura2000 site are alarming. The fragmentation rate will result in even more long-lasting effects on natural development and wildlife. The study advises natural regeneration, while the State Forest Holding wants to convert the logged area to cultivations. Bialowieza is home to many different species, including ungulates, predators and animals that specialise on old-growth forests. It is a UNESCO World Heritage Site, with a Natura2000 site, a protected area landscape and a Biosphere Reserve in the Polish part. The UNESCO site area has four zones, for strict protection, nature reserves, valuable forest stands, and protected area managed by the State Forest Holding. Early 2017 the Polish government allowed a three-fold increase in logging activities in Bialowieza Forest. Their claim was to prevent an outbreak of bark beetles in the economic management zone. In fact, the outbreak of the spruce bark beetle (Ips typographus) attacked Norway spruce. The study found that the beetles affected about 7 600 hectares, 13% of the forest cover. The State Forest Holding therefore decided to remove all dead and dying trees with heavy machinery. 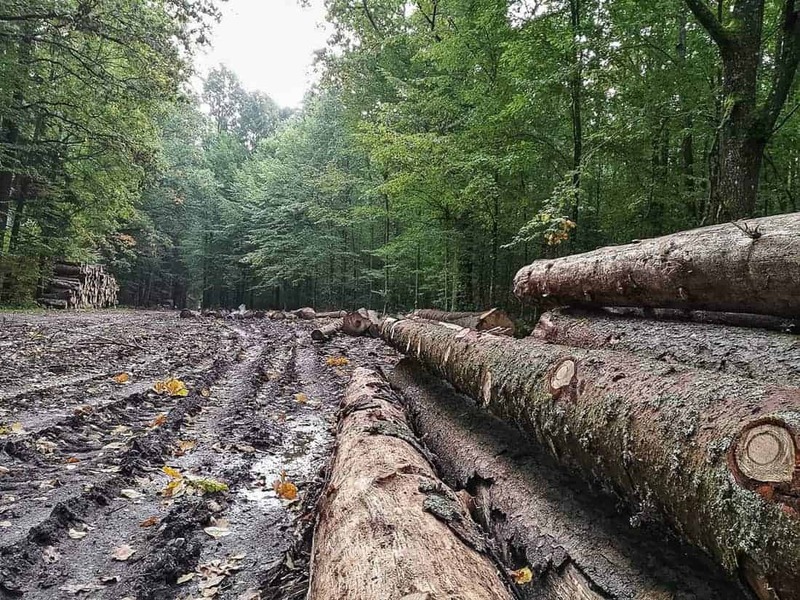 Poland received a warning from the EU Court of Justice, but continued logging nevertheless. Only when threatening with a big fine, the Polish government stopped the operations. Beetle infestation in the strictly protected zone was much lower, interestingly. The area that foresters cut clear in Natura2000 was ‘only’ 675 hectares, of which 229 hectares of old-growth stands. Logging was mostly in UNESCO zone 4 and 3, plus a few hectares in zone 2. The strictly protected zone 1 was left unaltered. This area is just 1,16% of the total forest cover. However, the study calculated the indirect impact with buffer impact zone. Using a 100 m buffer zone, the 675 hectares impacted 4 073 hectares (7%) altogether. Using a 500 meter buffer, the study calculated an impact on almost 21 000 hectares (35,7%) of Natura2000 area. Calculating the affected forest core areas, the study showed that up to 66% core area was lost in zone 4. The logging also directly impacts the fragmentation of the forest. Fragmentation decreases the ecological connectivity, resulting in smaller areas where animals and plants can stay. Since 2015, the index showing fragmentation rate increased with 26% for the entire Natura2000 area. The logging itself brought short-term disturbance by heavy machinery. The logging occurred during bird breeding season, impacting several rare species. Removing old and dead trees also reduced the chance for specialised animals to survive. But the fragmentation bring long-lasting effects as well. Micro-climates change, trees become more vulnerable to extreme weather, even predation rates can increase because of open spaces. The scientists conclude that it will take decades to restore the value of Bialowieza Forest to what it once was. They advise to leave the cleared areas to natural regeneration. This contradicts the proposal of the State Forest Holding to cultivate, replant and actively log these areas in the future. This form of sanitary logging is often misused and results in devastating impacts on the natural forests around it. If the people in Europe want to ensure that Bialowieza Forest remains a valuable piece of natural forest, we need to change. Less protected areas need to get a better legal and strict protection. Countries violating these legislations must take their responsibility for the damage they caused. As the scientists conclude, leaving nature alone is better than continue to interfere.